The inaugural International Student Energy Summit took place in Calgary, Canada - June 11-13, 2009 and brought together students from over 30 countries to discuss prominent energy issues. ISES received a tremendous amount of support from the corporate, academic and political communities. I would like to thank you for organizing the amazing conference - I am absolutely blown away. I've met so many amazing people who inspired me whether personally or professionally. Super sleep-deprived from the late-night chats but super pumped to make a difference as well! You have definitely inspired me! I will like to express my appreciation and congratulatory message to you for organizing such a historic event ISES 2009. Never in my experience in conference participation so far, have I seen such professional event managers. I shall forever remember my stay in Calgary and look forward to seeing you soon. The International Student Energy Summit is a unique and exciting event that I am very proud to be a part of as a student concerned about the future of energy. Our dedicated planning team has worked tirelessly to not only create an amazing learning opportunity but also an unforgettable experience. This summit is more than a one-time event; it is the beginning of a movement. Students are future researchers, teachers, industry experts and CEOs. We are eager to learn and even more eager to change the world. By bringing together 500 of the best and the brightest youth leaders, top-notch speakers and supportive sponsors and partners we are creating an environment conducive to positive change. 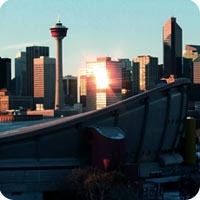 We are very proud to host you in one of the world's most exciting energy hubs-Calgary, Alberta. The amount of investment and community support for the energy industry is remarkable. It is a great place to learn, work and host the inaugural International Student Energy Summit. I encourage everyone, whether from politics, academia or industry, to take interest in this event and join us as we fuel the future of energy. This event is the catalyst for uniting like-minded students committed to creating a sustainable future. The ISES program was comprehensive and followed focused on 3 key pillars that encompass various challenges in energy. World renowned experts attended ISES to help give keen energy students the chance to learn from the best. Thank you to all our speakers who attended the Calgary 09 conference. Dr. Michael Klare Author of "Resource Wars" and "Blood and Oil: The Dangers and Consequences of Americas Growing Petroleum Dependency". Five Colleges professor of Peace and World Security Studies at Hampshire College. Defense correspondent of The Nation magazine. Bill McFarlane Past President of the Canadian Heavy Oil Association, Manager of Integrated Technology at Nexen Inc.
Wishart Robson Senior Advisor for Safety and Climate Change at Nexen Inc.
Jeremy Rifkin Author of 17 bestselling books. Served as an adviser to Chancellor Angela Merkel of Germany, Prime Minister Jose Socrates of Portugal, and Prime Minister Janez Jansa of Slovenia, during their respective European Council Presidencies. Dr. Randy Gossen President of the World Petroleum Council, Vice President of Global Business Relations at Nexen Inc.
Catherine MacGregor Vice President of Personnel, Sclumberger Ltd.
Dr. Jack Mintz Former president and CEO of the C.D. Howe Institute, Palmer Chair in Public Policy at the University of Calgary. Dr. Michael Klare Author of "Resource Wars" and "Blood and Oil: The Dangers and Consequences of America�s Growing Petroleum Dependency". Mr. Peter Tertzakian Chief Energy Economist of ARC Financial Corporation, author of A Thousand Barrels a Second. Dr. Dave Irvine Halliday Founder, Light Up The World Foundation. Dr. Roberto Aguilera Conoco-Phillips Chair in Tight Gas Engineering at the University of Calgary. Richard Strand President, Home Investment Management Inc.
Browse photos from the 2009 International Student Energy Summit. ISES would like to extend our sincere gratitude to our founding sponsor Suncor. Suncor Energy is an integrated energy company stategically focussed on developing Canada's Athabasca oil sands. Suncor also invests in renewable energy- wind power and biofuels. The University of Calgary established the Institute for Sustainable Energy, Environment and Economy (ISEEE) in 2003 to provide multidisciplinary leadership and development of initiatives in energy and the environment. Working closely with U of C faculties and schools, ISEEE's research and education programs are focused on: reducing the environmental footprint of fossil fuel production; developing a framework and strategy to mitigate climate change and enhance North American energy security within a global context; understanding and providing insights and technologies to address the environmental challenges associated with energy production in new frontiers (especially the Arctic); and developing technologies and implementation strategies to move Canada toward more sustainable communities. ISES would like to thank the Canada School of Energy and Environment for their contribution to the ISES bursary program. First established in 1938, the Energy Resources Conservation Board (ERCB) ensures that the discovery, development and delivery of Alberta's energy resources take place in a manner that is fair, responsible and in the public interest. The ERCB adjudicates and regulates on matters related to energy within Alberta. The ERCB also ensures that everyone affected by development has a chance to be heard in a fair and balanced manner. In addition, the ERCB provides information, knowledge, and advice through the collection, storage, analysis, appraisal, dissemination, and stakeholder awareness of information. Calgary, Canada. A global energy hub. Calgary is the largest city in the province of Alberta, Canada. It is located in the south of the province, in an area of foothills and high plains, just a short drive away from the famous Rockies Mountains. Calgary, Alberta is the energy capital of Canada and is a world leader in all aspects of energy development. All of Canada's major oil and gas companies are centered around the ten-block radius of Calgary's downtown core and the city houses nearly 2,000 energy industry companies. In Alberta, approximately one in six workers is directly or indirectly employed in the energy sector. Alberta has the world's second largest proven reserve in the oil sands, currently estimated at 175 billion barrels of proven reserves, second only to Saudi Arabia.